Clinton, IA. 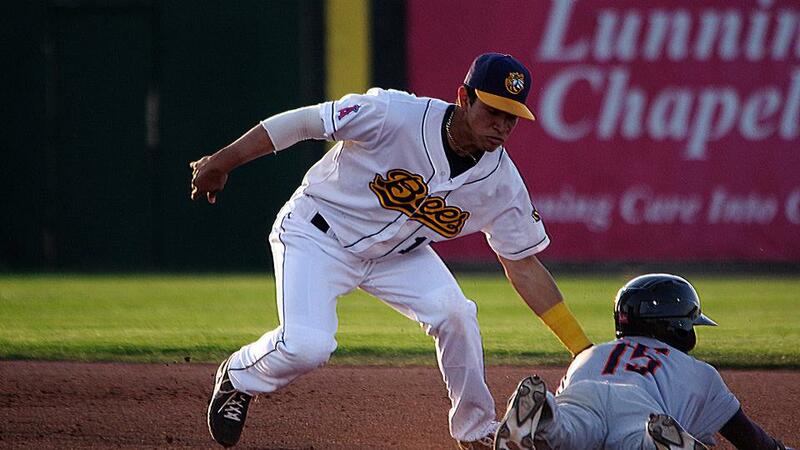 - The Burlington Bees (17-24) suffered another tough loss on Monday night, after losing their second straight inning game, losing to the Clinton LumberKings (22-18) 4-3 in ten innings. Sam Delaplane (3-0) won his third game of the season for Clinton, despite giving up the go-ahead run in the top of the tenth. Brett Hanewich (0-1) suffered his first loss of the season and blew his second save of the year. The LumberKings got on the board right away in the bottom of the first, taking an early 2-0 lead. Joseph Rosa leadoff the inning with a single, and advanced to second after an error by shortstop Julio Garcia, giving the LumberKings runners on first and second with no outs. Next batter Ariel Sandoval would drive in the first run on an RBI single, scoring Rosa and advancing Louis Boyd to third. Johnny Adams would later drive in Boyd on a fielder's choice to make it 2-0. The score stayed 2-0 for the next four innings, before the Bees managed to break the tie in the sixth. Kevin Williams Jr lead of the sixth with his first double of the season, and then Julio Garcia brought him in on his first triple of the season, making the score 2-1 on his 22nd RBI. Next man up Franklin Torres would hit a groundball to Adams at short, but it would be enough to score Garcia from third, giving Torres his 18th RBI of the season on the fielder's choice. The game would stay tied 2-2 through regulation and the game would be sent to extra innings. Spencer Griffin was the place runner to start the tenth and got to third base after stealing third for his first steal of the season. After a strikeout from Torii Hunter, David MacKinnon stepped up to the plate, looking to give the Bees the lead. However, MacKinnon didn't have to do much, because Griffin managed to score himself after a wild pitch by Delaplane, giving the Bees a 3-2 lead. However, Clinton wouldn't have to put the ball in play to secure the win. Hanewich started off the inning by hitting Nick Thurman, then walked Billy Cooke, loading the bases with no outs. He then walked the next hitter Rosa, allowing the LumberKings to tie the game 3-3. Five pitches later, he would hit Louis Boyd, scoring Thurman, and giving the LumberKings a 4-3 victory. You'll hear a lot of coaches say, it's the little things that win ball games, and the Bees didn't have those tonight. To start, Burlington had another two-error game tonight, which lead to two unearned runs score by the LumberKings. Hanewich allowed Clinton to win the game in extra innings, without even having to put the ball in play. The Bees offense struggled, suffering 16 strikeouts, only going 2-11 with runners in scoring position, and leaving eight runners on base. However, the Bees pitching was fantastic before the tenth inning. Mitchell Traver got the start tonight, and went five innings, allowed just two hits and no earned runs. Anfernee Benitez and James Ziemba both went two innings of relief, allowing no runs and Ziemba allowed just one hit and a walk, the only baserunners the bullpen allowed before the tenth. Clinton managed just three hits in the game, but the first inning error, and the two walks in the tenth, allowed them to sneak a game they really didn't deserve to win. Burlington will look to even the four-game series tomorrow, as game two will begin at 5:00 pm central time.